It was the speed that caught us off guard. And the noise. Like a roaring, out-of-control freight train. 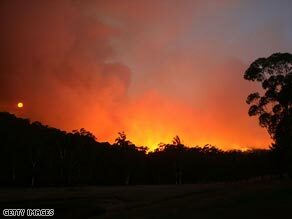 It was the mid-1980s and I was covering a big bushfire just outside Perth, the capital city of Western Australia. I say “mid-1980s” because we covered so many bushfires back then that the years have blurred the specifics of time. My cameraman and I were with firefighters along a country road, the crews using the road as a “fire break”, a last-ditch effort to stop the blaze jumping over and into hundreds more hectares of tinder-dry bushland. It didn’t work — the fire leapt from treetop to treetop in fireballs, straddling the road as if it wasn’t there. But that wasn’t our main problem. As we filmed, and the firefighters fought, no one noticed the fire form a “horseshoe” and cut us off from behind. We were stuck in the middle — the blaze had crossed the road in front of us, and about 150 meters behind. The only way out was through the flames. And so, with the fire truck leading the way, we sped through the thick, choking, acrid smoke and bright orange flame of a furious, wild thing that seemed to actually want to trap us. We got out, of course, and no one died that day, unlike the terrifying, almost unbelievable tragedy of the state of Victoria. I tell the tale because many have asked (reasonable) questions about those fires. Questions like: “Why on earth weren’t there evacuations” “How did so many people die” There are many answers, but the one that sticks out to me is the sheer speed of these fires. If you haven’t seen one up close, it’s difficult to comprehend how fast they can be. Imagine driving a car down a highway at 100 kilometers-an-hour. And being overtaken by a wall of fire. That’s what happened to many of those who died in Victoria. It was a perfect convergence of conditions. The bushland is tinder-dry fuel on the ground and plentiful; temperatures were in the mid-40s Celsius, winds howling and swirling. Under those conditions a fire will develop its own “weather system”. And it can become a capricious beast, turning 90 degrees in minutes, overwhelming people and property thought to be out of the way of danger. Towns are usually spared the wrath of a typical bushfire — not this time. There isn’t one fire either, there are dozens. And as quickly as one is contained, another can flare — balls of flame flying dozens of meters, or tiny embers carried hundreds of meters, starting new, separate fronts. You don’t “put out” these fires, you try as best you can to give them nowhere else to go and let them burn themselves out. It’s not happening so far, despite valiant, courageous efforts. To escape a typical bushfire isn’t too difficult — if the fire plays ball. But I can totally imagine how, amid these infernos, with their frightening speed and fickle twists and turns, people were caught unprepared, or in the wrong place. And with so many at the same time, often people had nowhere TO go. Friends and family in Australia have told me how stunned they are at the loss of life — not to mention the horrific injuries. There will, of course, be much soul-searching in Australia in the next few weeks. Inquiries have already been announced. Many are already blaming conservation policies that have prevented “controlled burns”, allowing “fuel” to build up in the forests and bushland. Whether mass evacuation programs should or can be enforced, or effectively thrown into action even amid such a wily conflagration. Others question the “Aussie” mentality that, to many, says “stay and fight for your house” if possible. But those issues will come later. The danger is not over, more fires burn, more lives and property are at risk as these past few days look increasingly like being Australia’s worst peacetime disaster.